When Mazda engineers and designers set out to create a new car, they set out with the intention as if they were going to own it themselves. The people of Mazda are driving enthusiasts who want every Mazda to provide a great experience, inside and out and especially from behind the wheel. Since the Mazda3 launched back in 2004, over 5 million drivers have made it the best-selling Mazda in the world. Today, the Mazda3 is the clear choice for those who truly enjoy driving. It’s hard to sum up everything that makes the Mazda3 stand out from the competition, but there are a double-handful of good reasons why this car deserves serious consideration. Cars are made to be driven. 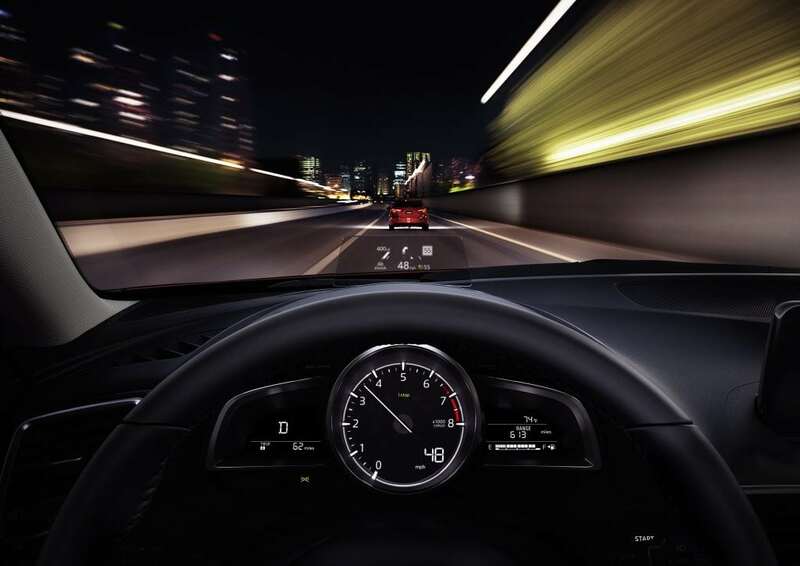 When you drive the Mazda3, you’ll feel what we call “Jinba Ittai” – a deep connection like the car knows what you’re thinking and is ready to do whatever you want. That’s no accident. Mazda designed it to do that and went the extra mile (actually, a lot of extra miles) to make the Mazda3 the best-driving compact on the market. For many reasons, the 2017 Mazda3 is rated as a Top Safety Pick+ by the IIHS. That’s because of the SKYACTIV body and the i-ACTIVSENSE suite of advanced safety features. SKYACTIV offers excellent collision protection scores, and it also gives you a more maneuverable and predictable car, so you help reduce the risk of collision in the first place. Mazda’s i-ACTIVSENSE suite includes Mazda’s Smart City Brake Support (SCBS) to mitigate an inescapable collision, Advanced Blind Spot Monitoring (ABSM) with Rear Cross-Traffic Alert and Mazda Radar Cruise Control, which can automatically maintain following distance. When Mazda engineers tuned the Mazda3’s 2.5-liter engine, they benchmarked the throttle response against the legendary Porsche 911, and the engineers didn’t stop until they mirrored that performance. Where other engines take a moment to “wake up” when you step on the gas, the Mazda3 is ready to go. The available 2.5-liter SKYACTIV-G engine in the Mazda3 produces 184 horsepower and 185 lb-ft of torque, while still achieving EPA-estimated fuel economy up to 28 mpg city/37 mpg highway. The KODO–Soul of Motion design philosophy that shaped the Mazda3 was born from timeless Japanese aesthetics. Where most compact cars are bland, or even overwrought on the opposite side of the spectrum, the Mazda3 hits the sweet spot in the middle, projecting a graceful, athletic form that captures the moment when energy turns into movement. There’s a good reason why Mazda3 owners always take an extra look back at their cars and smile. Driving is at the center of Mazda’s philosophy, so Mazda engineers obsessively study how drivers operate the vehicle. Mazda engineers examined how drivers hold the steering wheel and then designed its ergonomic leather-wrapped wheel. Even better, you can get that wheel heated for cold mornings. The steering wheel is your main connection to the car, so it should always be one of the best feeling parts of the car. The fact that the Mazda3’s interior has won numerous awards for design and build quality is icing on the cake. Your eyes belong on the road, not looking at the dashboard. That’s why Mazda is the only mainstream compact brand with an available Active Driving Display. This advanced tech projects critical driving information directly in front of you, right within your line of sight, from speed to navigation turns to even speed limits and blind spot warnings. That allows you to process information faster by keeping your eyes focused on one place—the road ahead. Every 2017 Mazda3 comes with Mazda’s exclusive G-Vectoring Control (GVC) technology. GVC uses engine timing to reduce torque output very slightly when cornering, adding downward pressure to the front end of the vehicle. That pressure increases the front-tire contact patches, which aids in steering stability and turn-in response. G-Vectoring Control provides a stronger sense of unity between driver and car, resulting in greater confidence and control for the driver that he or she won’t find from any other brand. Grand Touring models come equipped with LED headlights, which are brighter than the old HID lights, while running cooler and using less power. The lights not only look awesome, they help improve your nighttime visibility, and they’re a major factor in IIHS safety tests. To make your ride more relaxing, Mazda made the 2017 Mazda3 the quietest yet. They did that with new dynamic dampers in the chassis designed to soak up vibrations. Then they made changes to the ceiling, floor and doors to help suppress wind noise at high speeds. The design team also specified tighter body gaps and improved the sound insulation everywhere. All that made this year’s Mazda3 3dB quieter than last year’s in Mazda’s in-house testing. Honestly, the team just wanted to make the available Bose® 9-speaker surround sound system even more epic. Now comes the hard choice: hatchback or sedan? The Mazda3 comes in a functional five-door hatchback or a sleek sedan. Either way, you’re getting a lot of car for not a lot of money. There are many more reasons why the Mazda3 is among the most popular driver’s cars on the market, but the best way to get the whole picture is to go and experience the car in person. Compare for yourself. We’re confident you’ll see why the Mazda3 continues to be the go-to for its unbeatable combination of quality, driving experience and design.